Mary Cornière’s love for health and fitness started 14 years ago. It was then that she saw the benefits that vegan nutrition had in the recovery of a Cancer patient. Because of her desire to live longer and enhance her quality of life, she further learned about the strength and energy gained through the use of vegan nutrition and exercise. This interest for health grew as she furthered her knowledge as a Kinesiology student at Simon Fraser University, Canada and completed her Masters of Physical Therapy in Scotland. Mary is also a NSCA Certified Strength and Conditioning Specialist, ACE, REPS and BCRPA Certified Personal Trainer and CWA Climbing Instructor. Mary enjoys rock climbing, hiking, river rafting and running with her vegan dog, Bella. She also loves participating in bouldering competitions and obstacle endurance events like "Tough Mudder". Fourteen years ago, I was helping a good friend who had cancer in the large intestine. Her doctor recommended to her that she should try a vegan/vegetarian diet because it would be easier on her digestive system and large intestine. As a result, it would help with the healing process. I thought this was very interesting, so I did my research about the health benefits of a vegan diet and from that day forward, I became vegan. My friend no longer has cancer. I’ve been vegan for over 14 years. My energy levels and health feel like they have skyrocketed. Veganism means the world to me. It’s a huge passion of mine. It’s important to me to educate those around me who are not vegan and to surround myself with friends who are vegan so that we can share the same values. I’m an avid rock climber/boulderer. I climb 3-4 times a week for 4-hour sessions. I lift weights 3 times a week. Yes. I’ve been a Certified Personal Trainer for 10 years. I am also a Registered Physical Therapist. I also run 10km with my vegan dog, Bella, 5-6 days a week. The biggest misconception is that an athlete can’t be successful if they are vegan. Firstly, I educate them about vegan nutrition and how it aids recovery. 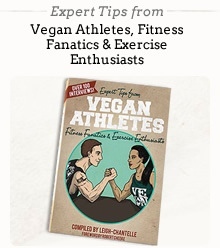 Then, I show them links to other amazing vegan athletes. My recovery is my biggest strength. I can fit more training sessions in a week. Also just feeling clean and energetic - eating an all-natural, vegan diet makes my body feel like a super vegan athlete. Reaching for super small and far holds (the crux!) when I’m climbing outdoors in Fontainebleau, France. Most understand my choice of being vegan. Most climbers are very respectful to one another and the environment. I have a great vegan community in Paris, France. Most of my close friends are vegan. My mom always supports my vegan diet and makes delicious meals when I visit her. Recently, my husband’s family, who is French and not vegan, made me 100% vegan meals - they ate it, too! Comment: “But you live in France, how can you not eat cheese?” I tell them I love cheese. I eat lots of vegan cheese and I am very addicted to it. Then, I tell them where I get it from and tell them how much healthier it is for me vs. dairy cheese. If I have some around, then I offer them to try some. Question: “Where do you get your protein?” I tell them I get it from many, many plant-based options such as nuts, seeds, legumes, quinoa, soy products, rice, hemp protein, spirilina and vegetables. Keeping my body healthy and pure so I can live a long and exciting life to climb and discover boulders all around the world. Usually a kale berry smoothie with hemp protein, maca and spirilina. Once a week, I make vegan buckwheat pancakes with blueberries and bananas. This varies every day because I love variety. But, a large organic salad is one of my favourites especially if it has kale and avocado. I usually put some grated ginger and garlic to add a zing. Then I add sunflower seeds, pumpkin seeds, chia seeds and sunflower seeds. For the dressing, I mix fresh lemon juice, sesame oil and a little bit of agave nectar. This also varies every day. Since I live in France and my husband is French, I like making French recipes, like vegan quiche, ratatouille, crêpes or galettes. Vegan cheese, freshly baked vegan protein cookies, guacomole, raw almonds, apples, bananas and chocolate! Protein - Quinoa, chia and hemp seeds. Calcium - Kale and tahini. Iron - Spirilina and lentils. Yes. I occasionally take B12 and Vegan Vitamin D.
Weight train at least 3 times a week with low repetitions and heavy weights, then, progress the weight every week if you want to see results. Start a calorie intake journal. There has been a lot of scientific evidence that has shown that this is a highly effective method to losing weight. Keep doing what you are doing - eating well and exercise regularly. Lifting weights helps build muscle, which in turn helps increase your metabolism at rest. Lift weights 3 times a week with maximum repetitions of 20. I tell my clients that I am vegan. Afterwards, they always ask about veganism. I’ve had several clients become vegan because of me. Volunteer with me at an Animal Sanctuary. Afterwards, I might suggest some easy documentaries like Vegucated or Forks over Knives.